Last month end , we had Children Day celebration . This year, there were no performance as our school hall is under renovation. So we celebrated in our class. Two weeks before the celebration, our teacher asked us to confirm what food we are bringing to the party (if any). Nah...actually many mommies made delicious food for us la. There were hotdogs...opppsss...must say sausages from now on...spaghetti, bihun, fried rice, Frozen themed cupcakes, mini muffins, fried chicken, nuggets, fruits and many more....but opppsss.... nobody sponsor drinks ka? But no problem la...Cikgu whatsapps the night before asking if any parents would like to sponsor drinks and immediately got volunteers. Fun fun fun! on top of food and drinks...Mamarazzi also let me bring balloons to school. At first she was worried that we can't blow the balloons . One mommy jokingly said can ask Cikgu L to blow..*LOL*. Yes, Cikgu L came into our class and we had balloon blowing competition. End of the day, there were a lot of junk food to be distributed. Yup...Cikgu didn't let us eat the junk food. Instead , it was kept at one corner. End of the day, we distributed the junk food to bring home. It will be up to the parents whether to let us have junk food or not. Mamarazzi had to laugh when she saw this. Takes 3 to get a mop to mop the class. Papa was not around. So I told Mamarazzi not to cook dinner. Sure there will be leftover food from the class party. Our teacher very clever too. Told us to bring 2 empty containers. One to use as "plate" to eat in class and the other is to "tapau" excess food home. I "tapau" fried rice, fried chicken, nugget and sausages home. Also jelly and muffin for Papa to eat when he come back. Wah! Ask Cikgu L to blow what....???? So clever to use container as plate and to tapao food home. During my time, nothing would be leftovers as we had too little food. Most parents were not so generous like nowadays. We are so lucky . Many mommy bring loads of food . So nice, lots of food eat and some more can tapau home! Lol...junk food sure have punya. Once a year ok la. LOL at the mop picture! Junk food is what kids love best. That mop must be so heavy that it takes 3 to carry it. Everyone dressed up so nice for the party. My kids' party; everyone wore uniforms and bring foods and drinks. Yup, tapau some food home too that day. Our school let us wear gai gai baju for the celebration. My parents were never asked to bring/donate food either. 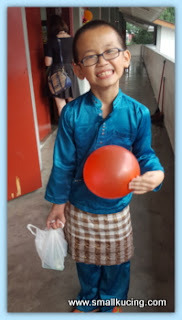 In fact, our school was very much parent-involvement free ;P We are given free school shoes, uniforms, stationery, a box of milk daily and buku pinjaman. No class Birthday celebration. 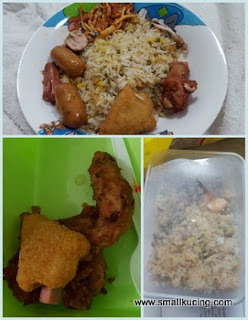 Concert adalah at senior level but makan sendiri tanggung. You little one looks so stylish and the food is truly a galore. Hungry now!! So good boy Joshua! Got leftover food for mama and papa too! 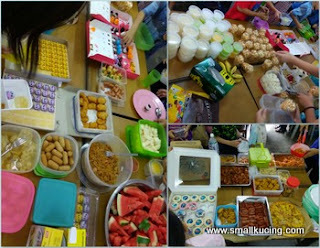 hehehee..
My year end class party/Children's Day party back in the day hor.. there's always a sheet pan of yam cake (which unsurprisingly unfinished at the end, so...), which I still find weird lah. hahaha who is selling yam cake? Wow, looks like so much fun wo! Reminds me of my own children days many years ago!! Such a fun day at school! And so much really yummy looking food, the moms did really great! Good boy. Very rajin. Hehe. You are one busy lil kitten ... Love, cat. 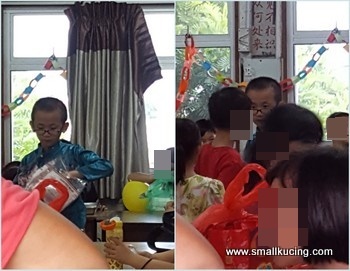 My kid's primary school used to distribute junk food at the end of the party ( whatever celebration) too. That's really funny, 3 to carry a mop...hmm, guess most of the load is near to the "mop" side, instead of the stick. So much fun!!! And wowwww!!! So much to eat! I wanna go too!!! hahaha if only you were still teaching, right? Fuhh....so many snacks brought back that day. So happy. Looks fun with classmates and lots of meals! 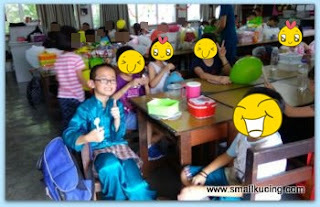 i like class party coz there will be no classes, summore lotsa food for makan makan & sembang sembang ;-) plus fooling around when cleaning the classroom! 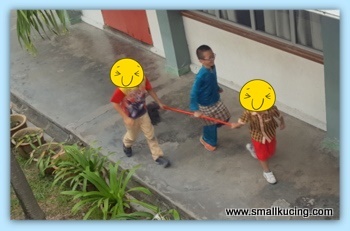 Seems like they have lots of fun on children's day. And, I really like your style of writing.